Instant Tan Eraser. Easily Removes Instant Tan Make Up. 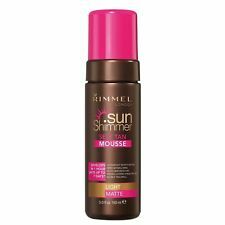 Rimmel London Sun Shimmer Instant Tan, Medium Shimmer 125ml Wash Off. GOLDEN COLOUR - WASHES OFF. Washes off with soap & water. Aerosol format spray for an effortless ultra-fine air-brushed tan effect. Water resistant, transfer-proof, streak free colour. Lasts up to 24 hours and washes off. 125 ml per tube (250 ml in total). Flawless tan for body and face. Transfer resistant. Water resistant. All over body. 200 ml per tube (400 ml in total). Perfect for all over body. Easy and smooth application under the shower which gives a beautiful sunkissed glow, leaving your skin hydrated and soft. For a flawless sun tanned look, apply to the face and body. Wash hands thoroughly after use. Transfer-resistant and water-resistant formula withstands sudden rain, splashes and spilled drinks. It lasts up to 24 hours and washes off easily with soap and water. Face & Body. Transfer resistant. Prepare skin 24 hours before instant tan application. Rinse off with warm water. SIZE 125ml. TYPE: INSTANT TAN. Flawless tan for body and face. Transfer resistant. Water resistant. LIGHT MATTE. INSTANT TAN. Wash off flawless tan for body & face. Rimmel Sunshimmer Self Fake Tan Mousse Natural Looking Gradual Instant Beauty. Condition is New. Dispatched with Royal Mail 1st Class. NEW" RIMMEL SUN SHIMMER PRE TAN EXFOLIATOR 125ML, GRAB A BARGAIN! Rimmel - Instant Tan Sun Shimmer Restistente all'Acqua Wash Off - 125 ml - Light Matte.